Historically, West Africa is associated with the slave, gold and ivory trades, perhaps most often the former. West Africa is also the place of origin of vodou, the only indigenous African religion to survive the trans-Atlantic slave trade and remain in practice in the Americas today. The historical roots of racial discrimination in the United States today can be traced back to North American slavery and the kidnapping of more than 20 million Africans. It is easily assumed, therefore, that the African slave trade pit brutal, gun-wielding European slaver traders against unsuspecting, passive African victims. While the Dutch, Spanish, Portuguese, English and French slave traders were often brutal, they were not always working alone — many Africans were also complicit in this victimization. 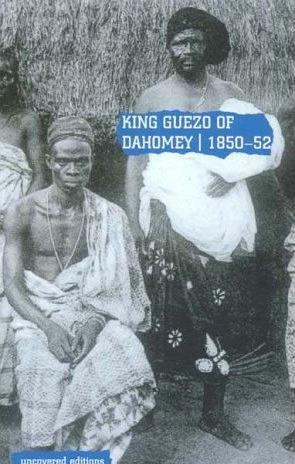 Precolonial empires such as Dahomey and Ashanti (located in what is now Benin and Ghana), where slave ports at Ouidah and Elmina flourished, accumulated enormous wealth and power as a result of the trade of their fellow Africans. In fact, Europeans often acted as junior partners to African rulers, merchants, and middlemen in the slave trade along the West African coast from the mid-15th century on. 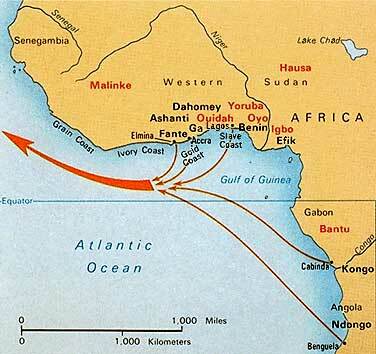 Two factors contributed to this dependency: the coastal geography and the diseases of West Africa. Seasonal wind patterns along the Atlantic coast of Africa generated heavy surf and dangerous crosscurrents, which in turn buffeted a land almost entirely lacking in natural harbors. Hazardous offshore reefs and sandbars complicated the matter even further for seafarers along the West African coast. European commerce in West Africa took place, therefore, most often on ships anchored well away from shore and dependent on skilled African canoe-men whose ability to negotiate across the hazardous stretch of water between the mainland and the waiting ships made the Atlantic trade possible. Even in places where Europeans were able to conduct trade on the mainland, their presence was limited by an epidemiological situation that impeded their livelihood and threatened their lives. Malaria, dysentery, yellow fever, and other diseases reduced the few Europeans living and trading along the West African coast to a chronic state of ill health and earned Africa the name “white man’s grave.” In this environment, European merchants were rarely in a position to call the shots. Furthermore, when Europeans first initiated a trading relationship with West Africans in the mid-15th century they encountered well-established and highly-developed political organizations and competitive regional commercial networks. Europeans relied heavily on the African rulers and mercantile classes at whose mercy, more often than not, they gained access to the commodities they desired. European military technology was not effective enough to allow them this access by means of force on a consistent basis until the 19th century. Therefore it was most often Africans, especially those elite coastal rulers and merchants who controlled the means of coastal and river navigation, under whose authority and to whose advantage the Atlantic trade was conducted. Domestic slave ownership as well as domestic and international slave trades in western Africa preceded the late 15th-century origins of the Atlantic slave trade. Since most West African societies did not recognize private property in land, slaves functioned as one of the only profitable means of production individuals could own. West Africans, therefore, acquired and expressed wealth in terms of dependent people, whether as kin, clients, or slaves. Moreover, caravan routes had long linked sub-Saharan African peoples with North Africa and the wider Mediterranean and Middle Eastern worlds. Not only was slavery an established institution in West Africa before European traders arrived, but Africans were also involved in a trans-Saharan trade in slaves along these routes. African rulers and merchants were thus able to tap into preexisting methods and networks of enslavement to supply European demand for slaves. Enslavement was most often a byproduct of local warfare, kidnapping, or the manipulation of religious and judicial institutions. Military, political, and religious authority within West Africa determined who controlled access to the Atlantic slave trade. And some African elites, such as those in the Dahomey and Ashanti empires, took advantage of this control and used it to their profit by enslaving and selling other Africans to European traders. It is important to distinguish between European slavery and African slavery. In most cases, slavery systems in Africa were more like indentured servitude in that the slaves retained some rights and children born to slaves were generally born free. The slaves could be released from servitude and join a family clan. In contrast, European slaves were chattel, or property, who were stripped of their rights. The cycle of slavery was perpetual; children of slaves would, by default, also be slaves. Although the historical reality is sometimes difficult to accept by African Americans who still face racial discrimination over a century after the abolition of slavery, African complicity in the slave trade neither justifies today’s social problems nor minimizes their seriousness. Fifteenth-century Africa, was not a homogenous group of people. Some African elites benefited from the enslavement of their rivals, their enemies, their poor, and other culturally foreign groups from the 15th century through the 18th and even into the 19th centuries. Class, language, religion, gender, and ethnicity divided Africans, and it was along these lines that certain Africans participated in the slave trade. Understanding the dynamics of African complicity in the slave trade is important in understanding Africans as historically active and diverse human beings. This understanding should not detract from the horrors of the slave trade or from its American legacy of inequality and racism. This entry was posted on July 8, 2010 at 8:30 am	and is filed under Racism. Tagged: Africa, Black Panthers, Democrats, Family, History, Life, News, Politics, Race, Racism, Republicans, Slavery, USA. You can follow any responses to this entry through the RSS 2.0 feed. You can leave a response, or trackback from your own site. Who knew? I never learned any of this as a child in school.